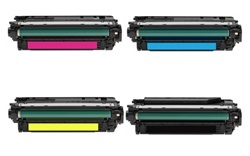 HP Toner Cartridges for HP Color LaserJet CM4540 Series, the HP 646X and HP 646A | TonerGreen - Eco-Friendly Toners from the U.S.
Own an HP Color LaserJet CM4540, CM4540f or CM4540fskm at home or in your office? Looking for printer supplies to keep your laser printers working? Then, you'll be glad to know that you can now print on your HP Color LaserJet CM4540 at a lower cost-per page while reducing your carbon footprint. And how will that be possible? Well, it's because TonerGreen.com, the leader in providing environmentally responsible printing solutions, now offers eco-friendly HP 646X, 646A toner cartridges. Experience ultimate Eco-Value when you purchase our remanufactured HP 646X, 646A toner cartridges practical environmental solution, world-class service, and the highest quality toner cartridges at the most competitive price. TonerGreen HP 646X (HP CE264X) black toner cartridge offers up to 17,000 pages while the HP CF031A cyan, HP CF032A yellow and HP CF033A magenta can print up to 12,500 pages. Toner Cartridge recycling saves up to 38,000 tons of plastic and metal from landfills each year. We work closely with various recycling facilities in the USA to source our toner cartridges. Our remanufactured HP 646X, 646A Toner Cartridges are made from 40-75% recycled parts. TonerGreen eco-friendly HP 646X, 646A toner cartridges is available for $469.99, while each toner cartridges can be bought separately for only $125. TonerGreen helps you cut down your HP printer supply costs by offering remanufactured laser printer toner cartridges compatible with HP printer models. With TonerGreen products, you can save as much as 60% and help save our planet at the same time. HP has also helped in supplying a complete range of toner cartridges according to the needs of its customers.